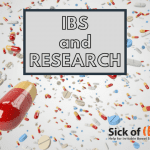 Home » WELL-BEING » IBS: Are you being careful with meds? Are you being careful with meds? Or do they tend to pile up? We are part of a culture of prescribing and taking meds. We have been brought up like this. All of us. You go to the doctor, they prescribe you something to give you relief, and you take it. I am questioning the system in which we have got into the habit of “taking something”. Yes we need relief. But are we getting it? There is a huge pharmaceutical industry that makes big money keeping this habit going. Go to the doctor, get a prescription and go. It is so common I don’t think most people question it. And to be honest I wouldn’t have questioned it if it hadn’t been for the fact that I couldn’t digest meds. I read in a consumer report that “More than half of us now regularly take a prescription medication—four, on average“. Thus survey was American, but I have read similar results in France and the UK. How careful are you being with meds? How many prescription meds or other products are you taking? Do they react well together? What are potential side effects? If you are seeing multiple specialists, do make sure they know what you are already taking and that you mention any new symptoms you are experiencing, even if they seem unrelated. And even if you are just seeing your regular, it is a good idea to mention any over-the-counter treatments or supplements you are taking and make sure that they do not interact with prescription meds. Is ANYONE asking WHY you have inflammation in the first place? 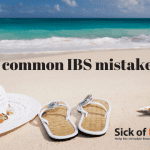 The problem with IBS and many of today’s current suffering is that meds don’t make the pain go away, even if they may help temporarily. Meds may help relieve inflammation. But if you are still taking them then it means they are not making the inflammation go away. What needs to change for your body not to need to be inflamed? Now that is a great question to ask your doctor and GI specialist. Can they answer you and tell you what you need to do? Trivia question: Did you know that petrochemicals are used in the manufacture of many meds?